T Ramaswamy Committee Report on Alternate Admission System for engineering programme. NEW DELHI : Fifty-two per cent of students who qualified IIT's advanced entrance exam (JEE Advanced) this year were self-taught and took no coaching, says an analysis done by IIT (Guwahati). The analysis said that 5,539 students (52.4%) out of the 10,576 who got admission to IITs had studied on their own. Those who went to coaching centres comprised 44.5% (4,711) of successful candidates. The remaining 2% either took individual tuitions or did correspondence courses. According to the IIT (Guwahati), the nodal institute that conducted the Advanced JEE this year in collaboration with the CBSE the IITs are still urban-centric with 75% of successful students coming from cities and the rest from rural areas. This is also indicated by the occupation of the parents. Of the 36,566 who qualified for admission into IITs, NITs, IIITs and other government-funded technical institutions, parents of 10,200 are in government service followed by 5,814 in business, 4,097 in private jobs, 3,213 in agriculture, 2,018 in public sector, 1,700 in teaching or research. Parents of 327 students practised law, 59 are in the pharmacy sector and only 21 are architects. Rajasthan known for its IIT coaching centres in Kota has contributed the maximum -- 1646 students -- this year. An IIT director pointed out that Tamil Nadu which once contributed a lot to IITs is surprisingly not among the top 12 states. Students going to CBSE-affiliated schools have done the best (5,849). IIT-Guwahati also did an analysis of educational qualification of parents whose children qualified for joint counselling to IITs, NITs, IIITs and other government-funded technical institutes. A little over 1,000 were illiterate, 5,090 matriculate, 14,619 graduate and 8,893 postgraduates. Educational data of over 5,000 parents was not available. Analysis also shows that parental annual income of 6,929 successful students was up to Rs 1 lakh. A similar but more exhaustive analysis conducted by IIT-Kharagpur, the nodal organisation for JEE-2014, that an overwhelming 63 per cent students who cleared JEE (advanced) did it without joining coaching institutes. A report by the IIT Kharagpur, which conducted JEE-Advanced 2014, revealed that more than 50 per cent of IIT aspirants from almost all the zones cleared the tests by preparing on their own. Out of 1,582 students who cleared the test from the Guwahati zone of the IITs, 998 (63.08 per cent) did so by going solus, or self preparation. Among the 6,528 students qualified from the Bombay zone, 3,509 (53.75 per cent) shunned the �other mode� of preparation, which apparently included attending classes in coaching institutes. 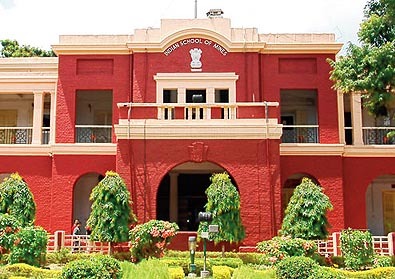 Similarly, 2,568 (56.05 per cent) out of 4,582 who cleared the test from the Delhi zone did it all by themselves, as did 1,865 (60.14 per cent) out of 3,101 in Kharagpur zone and 1,469 (56.35 per cent) out of 2,607 in Roorkee zone. The Madras zone remained an exception to this trend, with a mere 2,152 (37.57 per cent) out of 5,728 successful students telling the IITs that they had chosen the �other modes� over self preparation. The statistics showed students from the Central Board of Secondary Education (CBSE) virtually dominated the tests, with 14,955 (55.08 per cent) successful students out of 27,152 belonging to CBSE affiliated schools. It also revealed that the number of girls qualifying to pursue technical courses at the premier institutions remained low this year with just 11.08 per cent success rate. Similarly, a mere 9.77 per cent students from the rural areas succeeded in the tests. At 2,654, their numbers were dwarfed by the massive 24,498 from the urban centres. IIT-Kharagpur was the convenor of the test in which over 1.19 lakh candidates appeared. The report showed that the number of students from the southern states qualifying for admission to the IITs had increased in the previous one year compared to their northern counterparts, with the exception of Bihar, Maharashtra and Gujarat. students from Karnataka who qualified in the nation-wide test was almost double (47.95 per cent) in 2014, compared to 2013. Kerala saw an increase of 61 per cent. As many as 506 students from Karnataka qualified in JEE-Advance in 2014 as against 342 last year. From Kerala, a total of 475 candidates figured in the merit list this year against 295 last year. Andhra Pradesh, from where the highest number of candidates (4,975) qualified this year, witnessed an increase in the number of students making it to the all-India merit list by 34.53 per cent. In 2013, a total of 3,698 students had qualified from the state. Tamil Nadu too witnessed an increase in the number of students qualifying this year. As many as 603 students from the state figured in the list of successful candidates, against 450 in 2013. The IITs admitted 9,784 students, out of a total 27,152 candidates who figured in the all India merit list, after three rounds of counselling. In its report, however, IIT Kharagpur, the convener of JEE-Advance this year, did not give state-wise statistics on the number of students admitted to the 16 premier technical institutes. According to the report, Bihar was second among states in terms of increase in the number of students qualifying in 2014. The state, from where 1,509 students qualified in JEE Advance in 2013, saw 50 per cent increase in the successful candidates this year with 1,735 students making it to the merit list. The IIT report also indicated a significant increase in the number of students qualifying from Gujarat and Maharashtra in 2014. As many as 672 students qualified from Gujarat against 450 the previous year, an increase of 59.61 per cent. From Maharashtra, 2,313 qualified against 1,557 last year - a 48.55 per cent jump. From Rajasthan, 4,292 students qualified in 2014. The percentage increase in the number of successful students, however, remained at 18.20 per cent. In 2013, the state saw 3,631 students making it to the all India merit list. JEE-Advanced, 2014, was conducted under seven zonal IITs in 364 centres in 98 cities across the country, besides one centre in Dubai, on May 25. Over 1.19 lakh candidates took the test. �There has been a significant increase in the number of candidates who qualified in JEE Advanced, 2014. This increase is from 20,834 in 2013 to 27,152 in 2014,� the report said. NEW DELHI : Crumbling under government pressure, the Indian Institutes of Technology (IITs) lowered their cut-off marks on June 14 to admit 13, 542 more undergraduate students. The revision of cut-off marks was made by the IITs' Joint Admission Board (JAB) after declaration of results on Sunday -- first time since 2013 when Joint Entrance Examination Advanced was introduced. The revision of cut-off marks will swell the JAB merit list from 18,138 candidates to 31,680. When asked R Subrahmanyam, Secretary, Higher Education, MHRD confirmed that the government had to intervene as "otherwise over 1,000 seats would have remained vacant." The government prefers to have a substantial number of extra candidates on the merit list, he explained. HRD Minister Prakash Javadekar, later tweeted that "responding to requests from students and IIT community & to proactively ensure that all reservation seats are duly filled..." he had asked the institutes "to make available candidates... twice the number of seats in each category". The JAB met on Wednesday, June 13 and deferred decision on lowering the cut-offs, triggering the Human Resource Development Ministry to intervene in the evening and ask the IITs to relax the cut-offs. The IITs have a pre-determined cut-off of 35 per cent aggregate marks for general category candidates, followed by 31.5 per cent for the Other Backward Classes and 17.5 per cent for the Scheduled Castes and Scheduled Tribes. Apart from this, the general candidates need to obtain 10 per cent marks in each of the individual papers - mathematics, physics and chemistry - while the OBCs need nine per cent and the Dalit and tribal candidates five per cent. This year, the 23 IITs are offering 12,079 BTech seats, which include 800 supernumerary seats reserved for girls. Twenty-seven per cent seats are reserved for the OBCs, 15 per cent for the Scheduled Castes and 7.5 per cent for the Scheduled Tribes. Each category has a sub-quota of 5% for disabled ones. Of the seats on offer, 3,261 will go to the OBCs, but the number of OBC candidates on the first merit list was 3,140. Candidates who crack the JEE Advanced are eligible for admission to other top institutions too, like the Indian Institute of Science, Bangalore, and the Indian Institutes of Science Education and Research. NEW DELHI : Blissfully unmindful of the paucity of faculty and infrastructure in the new Indian Institutes of Technology, Human Resource Development Minister Prakash Javadekar pushed through his seat hike agenda at the 50th IIT Council meeting here on August 23, 2016. The Council, which met under the chairmanship of the minister, decided to add 10,000 seats per year until 2020. This will be done by adding 4,000 seats in undergraduate courses and 6,000 in postgraduate and Ph.D courses per annum. The yawning problem of limited hostel accommodation will be solved by allowing students to stay outside the campus in rented accommodations, particularly those seeking admissions in PG and Ph.D courses. At present the IITs admit 10,500 UG students, 8,000 PG students and 3,000 Ph.D students. The second important decision is to boost research -- and for this even B.Tech passouts will be allowed to do a Ph.D, deviating from the conventional practice of permitting only postgraduates to do doctorate programmes. Besides, a prime minister�s fellowship of Rs 60,000 a month for five years will be given to around 1,000 students to do research in IITs. At present, students pursuing M.Tech and Ph.D in IITs after clearing the Graduate Aptitude Test in Engineering (GATE) also get scholarship which will continue. An M.Tech student gets Rs 12,400 per month while a Ph.D student gets Rs 25,000 per month for the first two years and Rs 28,000 monthly in the next three years under the existing GATE scholarship. These scholarships will continue. Another decision taken by the council is to introduce a IIT-BHU prepared three-week induction course to allow students to adapt to their new environment, take up courses on languages and creative arts, and bond with classmates as well as faculty members. Classes will commence only after the induction course. The induction course, to begin with, will be introduced in seven IITs � Delhi, Bombay, Kanpur, Kharagpur, Madras, Roorkee and Guwahati. The IIT Council also approved a pilot run of a national aptitude test, which will be voluntary in nature and will not have a bearing on engineering admissions. The seat hike decision is worrying the IIT directors, and one of them, expressed angst saying "already the teacher-taught ratio in the IITs works out to be abysmal 1:15 instead of the desired 1:10, what is going to happen after the seat hike?" he asked. When asked by the reporters, Javadekar brushed aside the query by saying that the IITs would try to fill the posts by attracting Indians with Ph.Ds working in foreign institutions. 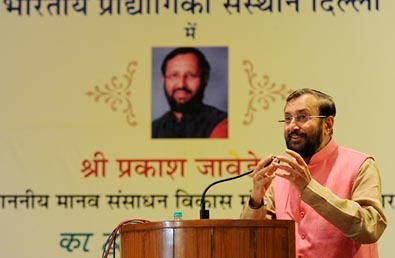 When coaxed for an answer he said his ministry has already launched the Global Initiative of Academic Network (GIAN) under which foreign faculty are being invited to Indian campuses to take a few courses; 260 foreign faculty have already visited in the last one year and another 800 would come in the next one to two years, Javadekar said. The council decided to start a Prime Minister's Fellowship to encourage B.Tech students to pursue Ph.D. The B.Tech graduates from IITs with good performance will be able to seek direct admission into Ph.D and get the Prime Minister's Fellowship of Rs 60,000 per month for five years. The government is planning to put in place an engineering aptitude test that students of classes 11 and 12 can take up to assess their ability to excel as engineers beforehand. Once the aptitude test comes into force, all aspirants will have to take it. The successful students will be able to take further engineering entrance tests. The council decided the IITs should conduct a pilot aptitude test in the next one year after which how to roll it out would be decided. NEW DELHI : On May 25 the Union cabinet decided to award IIT status to Indian School of Mines (ISM) fulfilling the promise made by Prime Minister Narendra Modi before the general elections in 2014. The Cabinet meeting chaired by the Prime Minister also gave ex-post facto approval to six new IITs, two of which, IIT Palakkad and IIT Tirupati, have already started functioning from last year. The Cabinet also granted ex-post facto approval for establishing an NIT in Andhra Pradesh. The four new IITs will start functioning from this year in Dharwar (Karnataka), Bhilai (Chhattisgarh), Goa and Jammu. They will offer 120 B.Tech seats each taking the total seats in 23 IITs to 10,500 this year against 10,000 seats offered in 19 IITs last year. In his budget speech last year, Union finance minister Arun Jaitley had announced the new IITs and the conversion of ISM to IIT. However, an expert panel, set up by the HRD ministry, was opposed to the conversion, subject to fulfilling a series of conditions. The committee, headed by former IIT Bombay chairman Ashok Mishra, had initially given an adverse report in view of deficiencies. But it was again asked to suggest ways to upgrade the 90-year-old ISM. In its second report, submitted last year, the panel highlighted several lacunae, particularly in the standards of faculty, in many branches and said that every faculty member at ISM should be evaluated by the same yardstick as that of established IITs. Faculty members falling short of the yardsticks should be sent to institutions like IITs or IISc to be trained and younger faculty without Ph.D should be asked to complete their thesis from IITs, IISc or any reputed institutions abroad, the panel had said. The committee said ISM was good for mining and petroleum engineering, earth science etc. However, departments like computer science, electrical engineering, mechanical engineering and chemical engineering weren't at par with IITs in terms of quality of faculty, research output, industry-linkage and international exposure. HRD Ministry sources said that all the concerns of the panel would be addressed in a time-bound manner. The institute had appointed 50 faculty members between 2004 and 2008 who were only M.Tech holders. The decision to upgrade ISM has spelt both a bane and a boon for the 90-year-old institute. Chairperson D.D. Mishra said IIT status would prevent the institute to open an off-campus in Visakhapatnam, despite the Chandrababu Naidu government offering 300 acres of land for the purpose. "There are IITs in every state. One IIT cannot set up a campus in a state which already has an IIT. ISM as a special type of institution could have opened the off-campus," Mishra said. MUMBAI : Most IIT Bombay professor have failed to infuse interest for studies among the students, says a study published in the students' magazine called Insight. The study published in the April issue of the quarterly magazine (Vol 15 Issue 3) says that about 88 per cent IIT Bombay do not study as their professors do not manage to generate interest in their courses. While a few teachers are enthusiastic about teaching, others are not, reveals the survey published in the magazine. Fed up with criticism about their �poor performance� compared to previous batches, a group of IITians from the current batch had conducted a survey on the campus. The first part of the survey focusing on why students don�t study at IIT-B, published in the January issue, had revealed that if not put on a deadline for an assignment, 75% students do not spend any time on academics. While more than 75% IITians seem to be more interested in pursuing hobbies, many are hooked on to social networking and micro-blogging sites. The second part of the survey, published in the April issue, focuses on issues concerning the teaching and learning process in the institute. In this report, students have included reactions from professors, and also made a few observations. At least 72 per cent students believe the course content is theoretical, lacks in application and therefore, is not interesting. Many IITians have sought a return to blackboard teaching as they believe that showing slides does not ensure value-addition from the teachers. The study says that teachers have cited large classes as one of the reasons for �inefficient teaching�. �With a shortage of faculty, the surge in number of students has not given enough time to the teachers and for the infrastructure to evolve,� says the report. Professors claim that they have to perform two jobs �teach and research. �It is not hard to see why it is possible that research could be more interesting and teaching could be relegated to being one of the unpleasant aspects of the job for many professors,� says the report. �Unfortunately, both teaching and research are fulltime jobs. Increased focus on one would impact the other,� says a teacher in the report. Also, 75 per cent of the students feel they can get a decent grade even by studying a night before the exam, which reflects badly on the standards of learning process.